Built at a cost of £2,000 and opened 6th July 1869. Originally open on the ground floor at the east end for the market. It was built by the Market House and Town Hall Company. It could be used for celebratory dinners, as it was in 1887 for Queen Victoria’s Jubilee. The Hall was bought by the ratepayers in 1891: the yard behind was included for the use by the council’s refuge collection service. 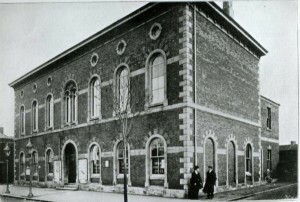 The first meeting of the Burnham Urban District Council took place here on the second Tuesday of January, 1895. Among the Council’s first actions was the formation of a Lighting Committee and also the Carriage Boat and Bathing Committee. 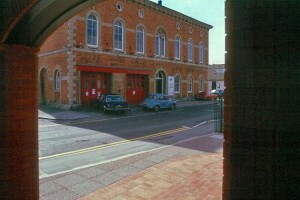 In the late 1920’s the Petty Sessions were moved to Burnham and held here. It was at a crowded meeting in this building in May 1929 that the scheme for the development of the South Esplanade and Marine Lake was overwhelmingly approved by a post-card poll of ratepayers. 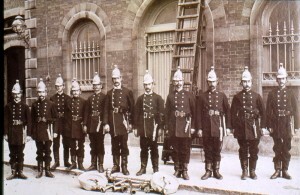 Burnham Fire Engines were housed in the east end of this building for many years. Pupils attending the Infant school opposite will recall seeing the engines leaving with their bells ringing.